Anonymous claims it has hacked and vandalized social networks and other sites in the Hermit Kingdom. The amorphous internet collective Anonymous claims to have struck a blow against the Democratic People's Republic of Korea, better known to the world at large as North Korea. As you may be aware, Kim Jong-un's regime has been rattling its sabers rather loudly, blocking South Korean access to a shared North/South industrial complex and threatening the U.S. with a nuclear attack, which it seems more capable than ever of actually carrying out. It's a sticky wicket for diplomats, but for Anonymous it's a chance to do a solid for democracy - or at the very least, to stir up trouble with little likelihood of repercussion. The group has claimed attacks on the news site Uriminzokkiri, which was still offline at the time of writing, and Twitter and Flickr accounts run by the regime were also compromised. 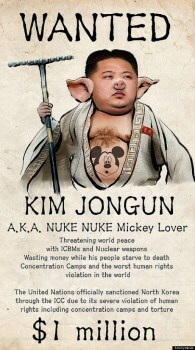 An image of Kim sporting a pig's snout and ears and a Mickey Mouse tattoo on his belly appeared on the Flickr account for awhile, but has since been removed; the Twitter account remains a mess, however, with links to hacked sites and an avatar featuring two people dancing and the words, "Tango down." The group also claimed to have accessed 15,000 user names and passwords from the agency's database. In a "message to North Korea," Anonymous claimed ongoing enmity with the government of the United States but stated that this matter "is not about country vs. country - This is about we, the people, the 99% (of USA and of North Korea) vs oppressing and violent regimes (like USA gov. and N.K. gov)!" The message includes demands that North Korea stop making nuclear weapons and issuing threats to use them, and that Kim resign and install a "free direct democracy." It also calls for uncensored internet access for all citizens. "To the citizens of North Korea we suggest to rise up and bring these motherfuckers of a oppressive government down!" the message states. "We are holding your back and your hand, while you take the journey to freedom, democracy and peace. You are not alone. Don't fear us, we are not terrorist, we are the good guys from the internet. AnonKorea and all the other Anons are here to set you free." It's fairly standard Anonymous fare (including the dire need for a copy editor) but it's an interesting situation to watch because there's virtually nothing impeding its attacks against the North Korean state. If Anonymous can disrupt the regime's activities at any level, I can't imagine the U.S. having much interest in stopping it, which potentially gives Anon a near-limitless laboratory/playground in which to do its thing. The North Korean army has warned the U.S. that it has been given official clearance to launch a nuclear strike against it, saying that "the moment of explosion is approaching fast" and that war could break out "today or tomorrow."